Fort William H. Seward (1898-1943) - A U.S. Army post established as Haines Mission in 1898 near present day Haines, Haines Borough, Alaska. The post was made permanent on 3 Mar 1904 and named Fort William H. Seward for Secretary of State William H. Seward, who purchased Alaska for the U.S. in 1867. Renamed Chilkoot Barracks in G.O. 54, 13 Dec 1922. Abandoned in 1943. Also known as Fort Seward (3). Fort Seward was the last of 11 military posts established in Alaska during Alaska's gold rush (1896-1903). 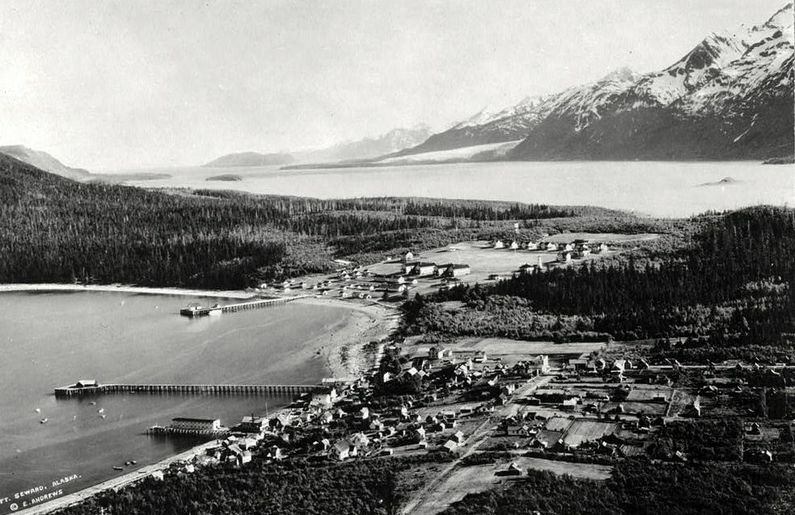 Established to preserve law and order in the gold camps, the fort also provided a U.S. military presence in Alaska during boundary disputes with Canada. The post was first garrisoned on 27 Sep 1904 by Colonel Thomas C. Woodbury (Cullum 2436) and three companies of the 3rd U.S. Infantry. Chilkoot Barracks was placed in caretaker status in 1943 and sold in 1947. Dates are formatted in yyyy-mm-dd to sort correctly. The Cullum Number is the graduation order from the United States Military Academy by year and class rank and links to a page for the officer on the website version of the Cullum Register. Listings without a Cullum Number indicate that the person was not a graduate of the United States Military Academy. Near Haines, Haines Borough, Alaska. Location: Haines, Haines Borough, Alaska. This page has been accessed 4,667 times. This page was last modified 09:24, 10 January 2019 by John Stanton. Based on work by Bill Thayer.